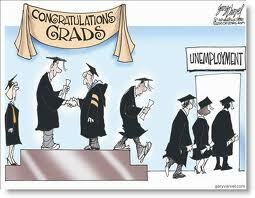 Telemachus: What Do These Unemployment Figures Really Mean, Especially If You Are A Recent College Grad? What Do These Unemployment Figures Really Mean, Especially If You Are A Recent College Grad? What do all of these convoluted unemployment data figures mean every month when they come out and every talking head on the tube starts yapping about them like they are some sort of expert or something? If you are the incumbent President, you want the unemployment 'rate' to be trending downwards towards Election Day. Especially in order to get them under the magical 8% mark. No incumbent President has won the White House with unemployment over 8% on Election Day since FDR. If you are against any incumbent President, you are sorta secretly 'pulling for' the unemployment rate to go up in the months before Election Day, aren't you? Political people say they don't...but they do behind closed doors. Democratic strategists such as James Carville were chortling 'It's the Economy, Stupid!' when Bush 41 was fighting a downward trending economy that led to Bill Clinton winning with only 43% of the popular vote. But what do all these facts and figures mean, really, to the average citizen? Especially the average citizen who does not have a job currently or is working part-time or in a significantly diminished role or pay scale relative to what he/she was doing prior to 2008. And sadly for the most recently graduated college classes of 2010, 2011 and now 2012. You have just graduated into perhaps the worst job market for college grads since the 1930's that basically all of the politicians who have been in office for the past decade and many of the financiers on Wall Street and speculators in the real estate markets have produced for you. 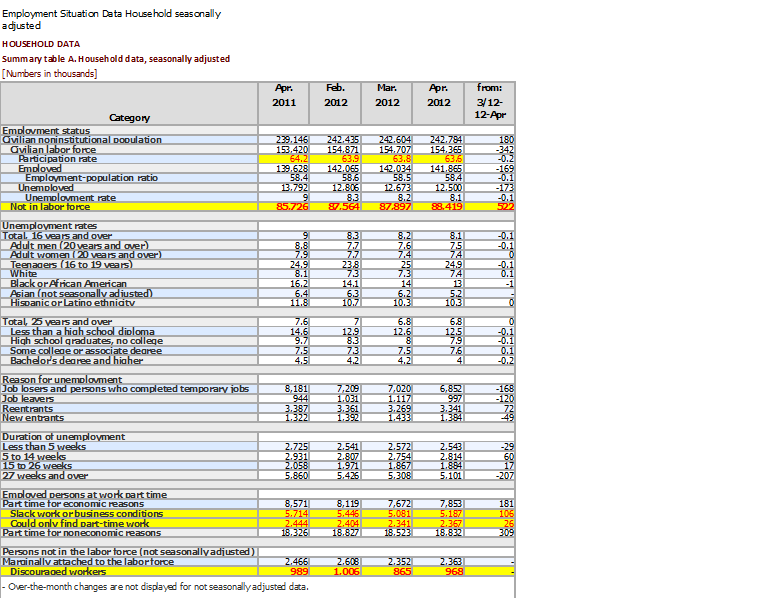 The key numbers in any unemployment report are not just the unemployment 'rate' as you can see in the chart. The key numbers are the absolute figures that estimate the number of American citizens who are actively working in the workforce this month versus last month; the number of people who are working part-time for slack economic or business reasons and the number of 'discouraged' workers who have stopped looking for work altogether on top of the 'marginally attached' to the work force people. It is one thing to know what the percentage of unemployed people is each month. But relative to 'what' precisely? If the rate is 'trending down' solely because the numerator is going down due to people leaving the workforce, how can that be the sole repository of information to tell us exactly what is going on in the economy? Tell us how many people are working and how many are not working. If the absolute number of people actually working full-time goes up each month, then we will all feel better about this crummy economy, won't we? So, to take last month's figures to task, we can see that while the 'official' unemployment 'rate' has dipped to 8.1%, down from a high of 10% in October, 2009, the number of people who left the workforce (and hence are still presumably 'unemployed') between March and April of 2012 was an astounding 522,000 people. According to the black-and-white numbers staring you in the face, the civilian labor force dropped 342,000 just last month. 169,000 fewer people were working in the workforce in April than in March. 103,000 just quit looking for work ('discouraged workers') between March and April because either there were no jobs to be found or, more importantly, they thought and believed there were no jobs to be found. That is a crisis of confidence and that is one of the few things a President and our leaders in Congress can actually do that will stimulate an economy. We don't have that confidence today, do we? Americans just need to see some glimmer of hope and then their 'animal spirits' of economic activity get turned on high gear and the economy will recover finally. It just ain't happening today. Add that to the relative steady number of 12.5 million unemployed people and we have over 20 million Americans out of work or are tenuously hired for the time being. In order to get to where most people start breathing a sigh of relief again, we probably need to be approaching what BLS economists and forecasters call the 'normalized' rate of unemployment in America which is typically between 5-6%. So we 'only' have about 3 million jobs to create or about 500,000 per month over the next 6 months before Election Day to get back to where we were before this economic meltdown occurred in 2008. It is quite a challenge. The question in the upcoming election is who do you think has the ability and leadership qualities to restore the confidence to the business community and economic system, President Obama or Mitt Romney? We all know that Congress and the US Senate almost needs to be completely replaced by some thoughtful adult statesmen and women who will take the task of running this nation's business seriously and not as some kind of joke or long-term employment program for themselves. But the next President for the next four years has got to be able to lead us out of these economic doldrums. Or else millions of American friends and citizens will face 4 more years of economic stagnation which might just be spiced up with some rampant inflation if we are not very careful.